For using drag and drop on iOS you have to open two apps in Split View or Slide Over mode first. Then touch and hold the item you want to drag until it lifts up. Drag the item to your destination (still holding down your finger) and then lift up your finger to drop it. This works on iPads only. On iOS the drop target is the currently visible view. This means no matter where you drop any task on the app, a new task is created in the currently displayed list with the settings derived from the view (i.e. when displaying a specific calendar date, this date is applied as next revied date for the newly created task). 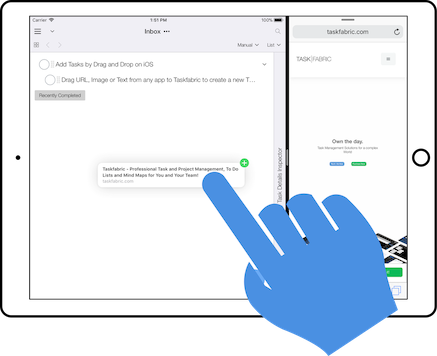 Safari (and other web browsers): Drag the URL from the title bar of your web browser to create a task with the URL address as task title. The URL is automatically added as attachment. If you select "View" for the attachment, the URL will be opened in your default web browser. Image File (from Apple Photos, Apple Messages and other apps): This creates a task with the file name as task title. The image is automatically added as attachment. This makes a copy of your image file in the database, so the file can be synced to other devices. Additionally a small thumbnail image is created. 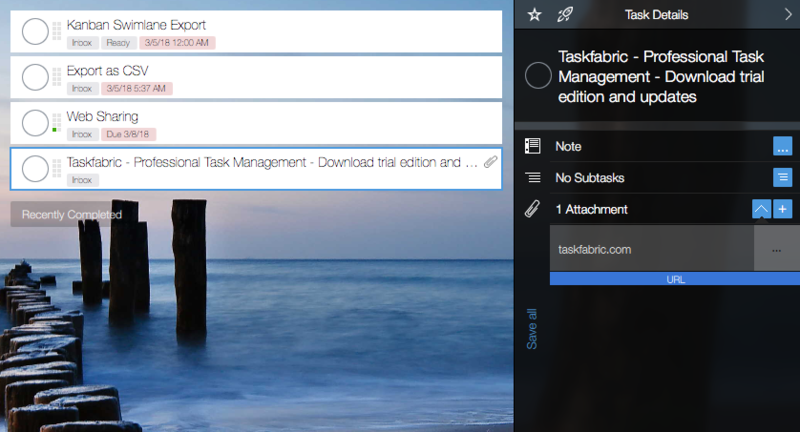 The thumbnail image is displayed as header in Kanban mode. If you select "View" for the attachment, the image file will be opened in your default viewer for this type of file. Apple Notes: The subject of the note is used as task title. Additionally the content of the note is added to the comment field in plain text format (formatting of your original note is not transferred). Apple Calendar: The subject of the calendar entry is used as task title. Additionally the planned time and date of the calendar entry is added to the comment field in plain text format (review date is not set automatically). Microsoft Outlook for iOS: At the time of this writing Microsoft Outlook for iOS did not support drag and drop. As soon as Microsoft adds this feature, we will add support in our app as well.